A description of Preesall-with-Hackinsall from 1938. THE former about 7 miles N. and the latter the same distance N.N.E. from Poulton, is a township in the Lancaster parliamentary division and Garstang county council division and union. Under an order of the Local Government Board, dated 14th March, 1900, an urban district council, consisting of 12 members, was formed, the first meeting taking place on the 12th April, 1900. ST. OSWALD'S MISSION CHURCH is a neat structure, consecrated in May, 1899. The building will accommodate 230 worshippers, and the total cost was about £3,500. It is served from Stalmine, in which chapelry the township lies. There is also an INDEPENDENT CHAPEL, erected in 1836, and renovated in 1875. It is seated for 260 persons. A CATHOLIC CHURCH erected is dedicated to St.Bernard. The village SCHOOL was endowed by the ancient family of Hesketh with land, out of which £13 a year is paid to the teacher. It was originally built in 1695, and repaired by Peter Bourne, in 1828; but a new school was erected on an eligible site in 1873, by James Bourne, Esq., and is now attended by 60 children. At Pilling Lane, a hamlet of dispersed dwellings, is another SCHOOL, endowed by Robert Carter, with 23 acres (customary measure), now let for £120 a year, out of which £1 is paid to the incumbent of Stalmine, and 10s. to the poor not receiving parochial relief. 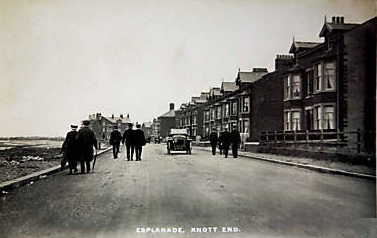 KNOTT END-ON-SEA is a favourite resort of visitors, pleasantly situated on the Wyre, and is in this township. The war memorial, situated on The Mount was from funds supplied by public subscription. In the township are salt mines, successfully worked. A recreation room was erected by the Preesall branch of the British Legion. The Preesall Brass Band have a new band-room, which is used also for dancing. The manor house called HACKINSALL HALL, the property of Mrs. Bourne-May, is now occupied by a farmer. It was thoroughly restored some years ago by Sir James Bourne, without, however, obliterating its links with a former age. The antique fireplaces have been removed, not altered, and the stone with the initials F.R.A., being those of Richard Fleetwood and Anne, his wife, were reinstated over the newly-constructed lintel. The moat has been nearly filled up, though its extent and direction can still be traced. There was once a chapel, or private oratory, in or near the hall. PARROX HALL, the ancient seat of the Elletsons, is a good mansion. The principal landowners are H. C. Elletson, Esq., and Mrs. Bourne-May. The township contains 3,232 acres, and the rateable value is £11,540. The population in 1851 was 823 ; 1861: 812: 1871, 847 1881: 848; 1891, 896: 1901, 1,423: 1921, 2,037 and 1931, 2,037. Urban District Council. - E.W.Worsley (chairman), Miss G.G.Ashworth, George McN. Parkinson, R. Unsworth, W. McNeal, W. Ashworth, J. Kershaw, F. Ingram, A. L. W. Fisher, J.P., W. Thomasson and W. Holden. Clerk : Joseph Hampson. Surveyor : H. Taylor, A.M.Inst.C.E., Medical Officer of Health : Dr. S. A. Neild-Faulkner. Post Office at James Bisbrown's, Village. Letters, via Fleetwood, arrive at 7-10 a.m., and are despatched at 9-25 a.m. and 5-30 p.m.
Post Office at Mrs. A. Blacow's, Knott End. Letters, via Fleetwood, arrive at 7-45 a.m. and 6-0 p.m., and are despatched at 9-30 a.m. and 5-45 p.m.